Ph.D. in Oceanography, University of Maine (pending); M.A. in Mathematics, University of Rochester; M.Sc. in Physical Oceanography, Memorial University of Newfoundland; Research Associate in joint appointment between the University of Maine School of Marine Sciences and GMRI. Since joining GMRI in November 2006, he has run the Ecosystem Modeling Lab. 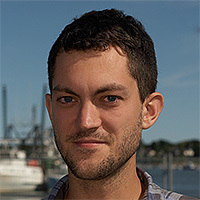 His research includes a number of modeling projects as well as a project on shore-based photogrammetry of surface oceanography. His primary modeling interests focus on the role of the physical environment in ecosystem changes.